Birding Corvo 2009: New Yank landbirds! Check out the Eurovision Rare Bird Contest on Petes blogg: http://peteralfreybirdingnotebook.blogspot.com/2009/10/eurovision-rare-bird-contest.html Today Sweden got one new point (Yellow-rumped Warbler) and Finland its first point (Chimney Swift). Two days ago Italy got its first point (Savannah Sparrow) and yesterday Denmark its first point (Indigo Bunting). Started in the Caldeira today with Fred, Rene, Jacob, Daniele and Hannu. On our way there we saw the newbie American Great White Egret on a field below Fojo in the morning. Found a new species for Corvo in the crater, but not a very exciting one; Garganey. 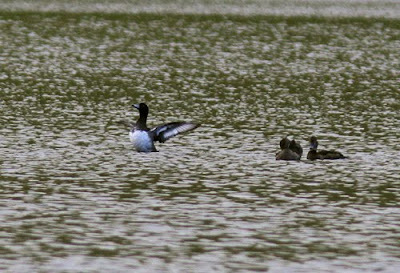 Other ducks in the crater included a bunch of Mallars, the Pintail, a Black Duck hybrid, the two Ringnecks and their new homie a male Tufted Duck. About 20 Common Snipe kept us alert as did a Grey Heron. The American Great Egret (the oldie) was also still around as usual. 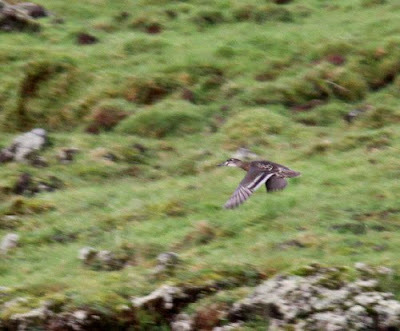 When we got out of the crater we found out that a Chimney Swift had been found over Fojo and was now flying around Pico/da Ponte somewhere. Walked towards the place and scanned but got interrupted by the news that a Yellow-rumped Warbler had been found by the reservoir! Walked there as fast as we could but the bird had disappeared in the flock of Canarys that it was feeding together with. Many of us searched the area but the bird wasn't seen again :( Some people saw the Savannah Sparrow again though. I only managed to see the Dotterels and a Red-throated Pipit :( Anyway, a good sign that birds are still arriving! Hopefully the winds that are blowing will bring even more stuff! Would LOVE to see an American Swallow for example! Kicked a few fields on my way back down to village and ended the day with an hour of seawatching which produced the regular ten or so Great Shearwaters and a bonus juvenile Gannet. Tomorrow me and Fred will search the island for the Great Blue Heron that everyone except us seems to see. Looks good for the weekend - here there is a first record of Eastern Crowned Warbler ! Your calling these migrants from North American Yanks, but might they not as often be Canucks? Birds know no boundaries, of course... Best wishes for more success.